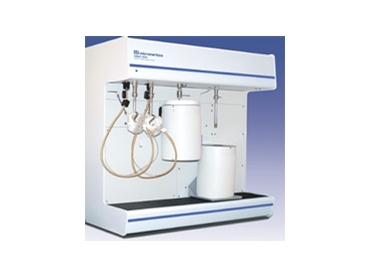 The ASAP 2050 Xtended Pres­sure Sorption Analyzer by Micromeritics and distributed by Particle and Surface Sciences , is an easy-to-use instrument capable of collecting high-resolution, extended-pressure adsorptive isotherms from vacuum up to 10 atmospheres (150 psi). Particle & Surface Sciences are pleased to promote this new product from Micromeritics Instruments USA. Equipped with all the features of the highly regarded ASAP 2020, this Windows®-compatible instru­ment delivers exceptional data for fuel cell, hydrogen storage, and other research applications that require high-pressure adsorption isotherms. The ASAP 2050 uses a stainless steel sample tube, capable of safely withstanding temperatures and pressures well beyond the system’s specifica­tions. This single port physisorption analyzer can be operated indefi­nitely using a chiller Dewar and a re-circulating bath. The ASAP 2050 Xtended Pressure Sorption Analyzer will also support the use of a Dewar with cryogen that will provide at least 50 hours of unattended analysis without refilling of the Dewar flask with liquid nitrogen. The ASAP 2050 is equipped with two independent vacuum systems – one for sample preparation and one for sample analysis. Hav­ing two separate systems, allows sample preparation and sample analysis to occur concurrently without interruption and without the risk of cross-contamination between the degas and analysis manifolds. The current research and devel­opment trends of adsorbents for gas separations and alternate energy (fuel cell and hydrogen storage) demand higher-pressure adsorption for the characteriza­tion of materials. The new ASAP 2050 Xtended Pressure Sorption Analzer meets these require­ments in a capable and easy-to-use package.